Memorial Christian Church owes a great deal to the Mitchell family. Its patriarch, Philemon Mitchell, came from Kentucky to Rock Island with his friend Philander Cable in 1856. They traveled by train, carrying the incredible cash amount of $80,000 with which they intended to buy a bank. They were successful in that endeavor and the pair prospered in their new hometown. As well as being a good businessman, Mitchell was religious. He had joined the Christian Church back in Georgetown, Kentucky. Also known as the Disciples of Christ, the sect was active in the 1800s “on the frontier” where it established many new congregations. Rock Island’s first Disciples of Christ congregation was founded in 1868 and consisted of only 15 members, including Mitchell. Some accounts say they met in a little German church at 5th Avenue and 20th Street (now known as Immanuel Lutheran); others say the services were in rooms above Mitchell’s bank. In either case the temporary quarters were indeed temporary. 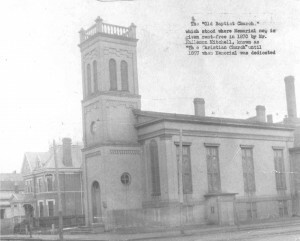 In 1870, Mitchell purchased a former Baptist church on the northeast corner of 15th Street and 3rd Avenue that had been built in the early 1850s. The Baptists had moved to their new building diagonally opposite. Mitchell offered the church rent-free to the congregation, now numbering 70, who called their new home the Christian Chapel. Moreover he donated the deed to an additional forty-foot lot to the north. 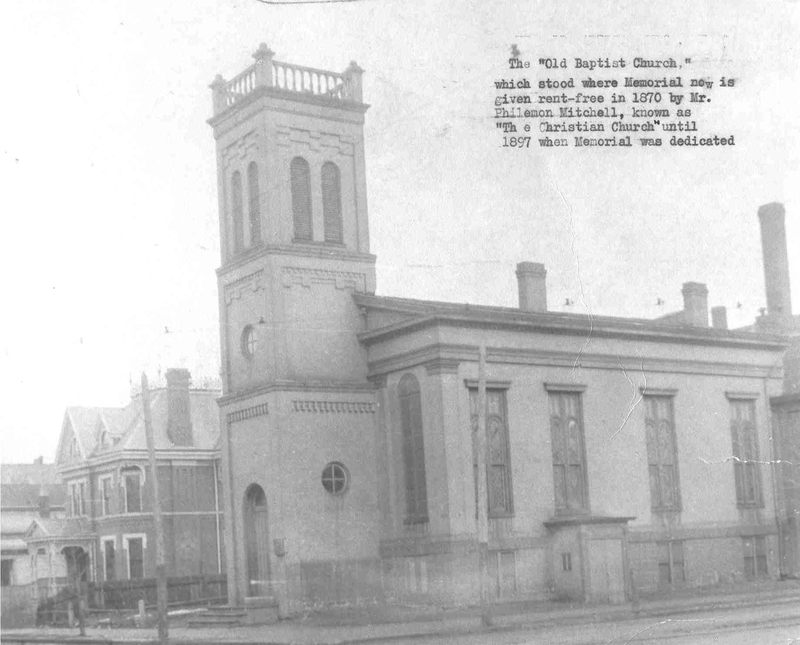 Vintage photos show the old Baptist church was a white frame building reminiscent of a Greek temple that faced 15th Street. It had a square bell tower in front with an entrance vestibule at the base of the tower. The congregation continued to grow in its new building. In 1894, Rev. Grafton initiated a building fund by ceremoniously placing a silver half-dollar on a table. Others also donated that day for a total of $8.16 – a not insignificant amount, but still a long way from the cost of a new church. Philemon Mitchell died in 1895. In his honor, his daughter, Mary Wadsworth, offered the congregation $25,000 to build their church. The old church was demolished and the new red brick church shown on the postcard was constructed on the same site. One report says the church took nine months to erect and cost $21,000. It was designed by architect H. K. Holsman of Chicago and constructed by local contractor John Volk. An Argus report said the completed building would be dedicated right after the New Year in 1897. An earlier dedication – perhaps a groundbreaking — took place on March 23, 1896, by which time the congregation had numbered 367. The members were so grateful to Mrs. Wadsworth that they unanimously agreed to name the new building Memorial Christian Church in memory of her father. The round arched openings – windows, bell tower, and doorway — as well as the horizontal banding and the simple gable parapets define the church as Romanesque in style. Closer inspection of the bricks shows varying textures. At street level, the walls are very dark colored and heavily textured chipped paving brick while upper stories are a lighter and smoother pressed brick with terra cotta trim. One account says the interior was designed to seat 300, another says it could hold 400-600 people. The arrangement was such that no one would be seated more than 75 feet from the speaker. The balcony choir loft hung from the walls, with no visible columns for support, and was decorated with raised fresco (plaster) work in a naturalistic theme. A large domed recess in the sanctuary ceiling was originally encircled by light bulbs and later framed a properly scaled chandelier. 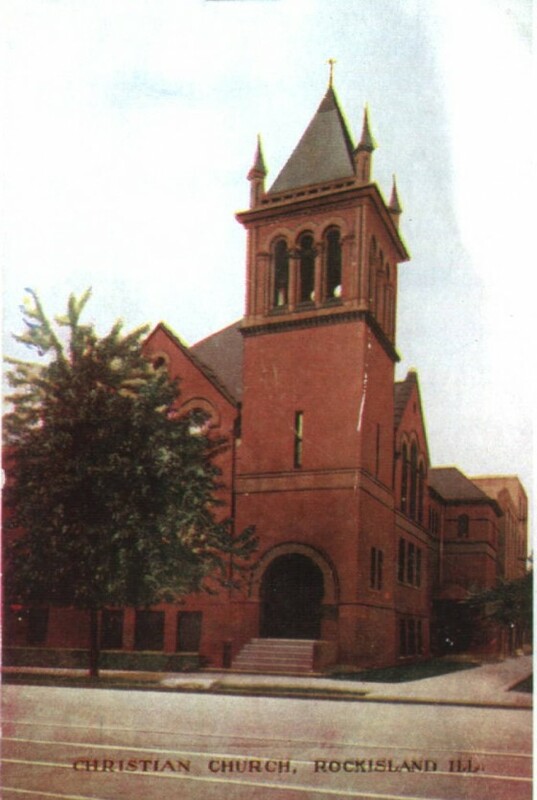 Over the decades, the church changed very little from the circa 1910 postcard. Stairs at the main entry now angle off to either side rather than straight out to the street as the postcard shows. Two additions, one in 1953 and the other a decade later, provided needed space for the growing congregation. Memorial Christian church once contained many spectacular stained glass windows. The largest and most magnificent was covered when an addition north of the original building was constructed. Later the window was illuminated electrically from the back so that it glowed as brightly as ever for those inside the church. UPDATE since postcard article originally published: In 2006, the congregation of the church announced their intent to move to another location and sell the building, although the decision was disputed by many long time church members. A landmark application to the Rock Island Preservation Commission was made by one member of the congregation. This would have protected the exterior of the church, including stained glass windows. The application was approved, but was overturned soon thereafter when an appeal to the Rock Island City Council was made. Subsequently, the remaining congregation held an auction and sold everything in the former church that could be removed – stained glass, pews, railings, etc. Since that time, it has remained empty and unsold. This article by Diane Oestreich is slightly modified from the original, which appeared in the Rock Island Argus and Moline Dispatch on July 14, 2002.